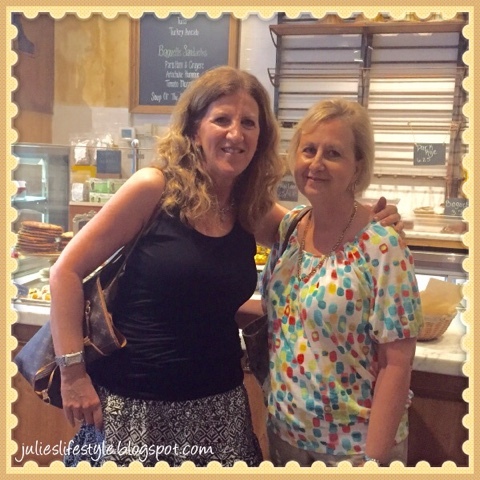 Julie's Creative Lifestyle: Meet Up With a Blog Friend! Hi friends. Last week I had the opportunity to get together and meet Amy the blogger from Ms. Toody Goo Shoes. Amy and I don't live that far away from each other so we decided to meet for Iced Coffee at Le Pain Quotidien. It was such a nice afternoon and I enjoyed catching up with her and talking about blogging and getting to know each other better. Please visit Amy's lovely blog Ms. Toody Goo Shoes where she blogs about food, traveling, her house, and more. I'm so happy we arranged to meet with each other and I look forward to meeting with Amy again in the future. Thanks Amy for the fun afternoon and I'm so glad we had the opportunity to meet. If you live in the New York area we would love to have you come and meet up with us next time! To read the blog post about the first blogger I met you can click HERE. Have you had the opportunity to meet a blogger in person? No, I have never met any of my blog friends in person but I hope one day it would work out!! I am sure they are just as lovely in person. I am going to go and visit Amy right now! !And great photo BTW. OOPs ...I have met Myra at My Blessed Life! She lives nearby! That's so neat!! I bet you had a lot to chat about! I love that you got to meet another blogging friend, Julie! What fun for both of you. Aw that's great! Sounds like a fun time. Great picture of you! I haven't met any face to face yet! Lucky you! I love LPQ too...great place to meet up and chat! It was so great getting to know you, Julie! Thank you for the post :) Looking forward to more get-togethers! Hi Julie - I've just come across from Amy's blog. So great you had the opportunity to meet up and I love the gift you crocheted. How sweet that you got to meet another blogger. I wish I had that opportunity. I have never met any of my blogger friends and that would be terrific. I am sure we would have so many interesting things to share. I live in New Jersey and I really have not come across many bloggers in this area. Oh Julie, I am so glad that you got to meet another blogger. Sounds like you girls had a great visit. I'm going right over to see her blog. How fun! I'm glad you had the chance to meet! I wish I lived close enough to visit some blog friends. Maybe someday. Have a lovely week Julie! I've met many, but mostly at Haven. I have talked on the phone with several, and that's almost as nice! That is always such an awesome feeling when you meet another blogger. You two look great! Love your top Julie. How wonderful and I feel jealous! My dream is to meet one of my bloggy friends one day...hope I'm so lucky and fortunate. Thanks for visiting me lovely friend. How wonderful to be able to meet your blog friends! I haven't met anyone yet - mostly due to the fact that the majority of them are on the other side of the world, but one day I would love to be presented with a chance like this! © Julie's Creative Lifestyle: Meet Up With a Blog Friend!